The below poster is right about the brightness, but this is only in the lounge area and the back where the music is played. The front bar has quite a bit of character thankfully. Only drink i had there was a bottle of Foreign Extra Guinness and came in at a welcome £2.90. I want to love you, Effra, but white washed walls and 100 watt light bulbs are great for interrogations, not pubs. Repaint the walls back to that nice cosy tobacco, turn the lights down and you'll be truly great once again. I won't even mind drinking Red Stripe. Please!! The Effra Pub has just got better and better with time. 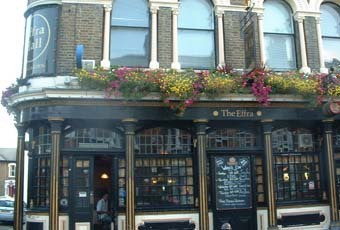 In the 11 years that I have been running the sunday Nite Jam The Effra has become Londons best kept secret. Come on down and join in a full fit to bursting jam on sundays, great food all week long and friendly bar staff. facebook or laurendalrymple.com for more information. See you all there!! Just been told that it has closed down, is this true?